We are yet to see the Ernst and Young Report of 2007 titled "FNFP Special Investigation - Internal Report". Now, Coupfourpointfive has been informed the Report has not been made public by Aiyaz Sayed Khaiyum because a section of it is highly critical of the Tappoos, to whom Khaiyum, through his private company Latifa Investments Ltd, had sold his Berry Road property at a grossly obscene price. Our regular contributor, VICTOR LAL, has been examining the Report and has filed Part Two of his investigation. The FNFP Board had on 18 October 2004 approved the pursuit of the FNPF/Tappoo Investment through FNPF Investment Board (FIL). Minutes of an FIL meeting held on 16 December 2004 indicate the design of the Project was flagged at this meeting. It was proposed that the Project would compose an 8storey building with retail space (three floors), a cinema, food court (one floor), offices (two floors) and a car park (two floors). It was estimated according to the Board Minutes that the Project would cost a total of $23-$25 million. This was a change to the original project as described in the MOU, which described only six or seven story complex. Pursuant to the Joint Venture arrangement, land which was owned by Tappoos, located adjacent to the FNPF site, would be simultaneously redeveloped, with the aim of utilising the whole block for development. On 9 March 2005, a Joint Venture Agreement was signed by FIL and Tappoos. Penina Ltd was incorporated on 2 May 2005. The issue capital of Penina Ltd included 30,000 shares of $1 each, of which 6,500,000 were paid up upon the incorporation of the Company. Each shareholder contributed their respective land lots as consideration for equity in Penina Ltd, with the land valued at $6,500,000 for the purpose of this equity issue. The following individuals were members of the Board of Penina: Olota Rokovunisi and Neal Wright, representing FNPF and Kanti Tappoo and Vinod Tapoo, of Tappoos Ltd.
FNPF land was valued at $3,315,000 and Tappoos land was valued at $3,185,000 for the purpose of the equity issue, which resulted in 51% of the shares being allocated to FIL and 49% to Tappoos. Further equity comprising 4 million redeemable preference shares in Penina had been issued to the shareholders on a 51% and 49% basis in consideration of cash totalling $4million. On 10 May 2005 Penina Ltd ratified the Joint Venture Agreement (JVA). Rokovunisea, Wright and the Tappoos were appointed as directors of the Company, and David Hanfakaga was appointed Company Secretary. FNPF Board Paper No 1707 dated 23 July 2003 estimated that the Construction cost of the development would be $14 million, with a total development cost of $20 million. It is not known upon what information or assumption that estimate was based, as pointed out by Ernst & Young auditors. By December 2004 the total project cost range was estimated at $20-25million. The JVA, signed in March 2005, noted that the total project building cost, including consultants, was estimated at $30 million. When the land cost was included the total project was set by the Board of Penina at a board meeting held on 10 May 2005. 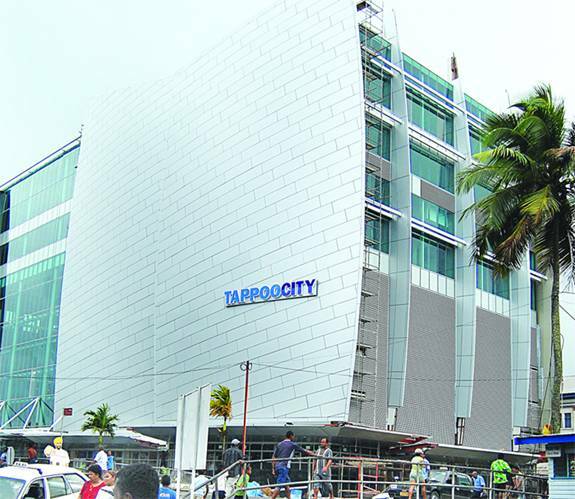 A document titled “Board Paper No (no number) Penina-Tappoo City project – Request for Approval of revised Construction Budget from $25m to $38.6m”. In October 2005, FIL estimated the total cost of the project at $42,500,000, which included the estimated construction and contractor cost of $36m (including interest capitalization of $2million) and the land cost of $6,500,000. In mid-2006, after the construction contract had been awarded, the Project cost estimate was revised upwards, to approximately $44 million. On 26 September 2005, Pradeep Patel of Deloitte (now charged with reviewing the FNPF’s controversial Natadola Project) provided advice to Penina Ltd regarding the financing of the Project in a document titled “Financial Projections”, in which he proposed that Penina issue equity totalling $10,5000,000 and obtain a term loan of $31,300,000 from FNPF. Various financial projection scenarios were attached to this document, based upon four different proposed funding scenarios. In the FIL Board Paper No 1948 dated 30 November 2005, Penina Ltd’s request for a loan of $32,000,000, which included the estimated cost of building construction, consultant’s fees and capitalised interest during the construction period, was described. The Board of FNPF approved a loan of $32 million to Penina on a twenty year term, fixed at 6% for the first 12 years with repayments based on a loan authorization over 20 years, after which the remaining balance will be refinanced or rolled over. On 6 January 2006,FNFP wrote to Penina providing notice that the Board of the FNPF had approved the loan for $32million. Note that after the construction contract was awarded the total project had increased and hence a loan extension was sought by Penina Ltd. In Patel of Deloitte’s ‘Financial Projections’ for Penina dated 26 September 2005, he provided Cashflow Forecasts, project Forecasts and Balance Sheet Forecasts for the Project, which incorporated rent payable by Tappoos to FNPF calculated at 8% of the estimated cost of $39,300,000, set for a fixed term of 15 years (increasing to 10% of the estimated construction cost for the balance of the 10 year contract term). Oh this basis, Pradeep Patel estimated that the rental income to Penina from the Project would be approximately $3,100,000 per annum for the first 15 years after the completion of the Project, with the next profit of approximately $2,900,000 prior to loan repayments to FIL. In relation to revenue, FIL would generate from the project, a document titled “Return on Investment from TappooCity Project to FIL” dated 16 May 2005 (author unknown) noted that returns to FIL on this Project would include interest at 5.6% from the loan to Penina; receipt of 1% of the profits form the Joint Venture Company and the increased capital appreciation of building. Another short-term potential source of income for FIL from this Project was a penalty of $40,000 per month, which was payable by Tappoos to FNPF upon FNFP’s initial interpretation of the comment of this Project was delayed beyond 2005. The justification for this penalty payment arrangement was that FNFP would be losing rental income form the time that the initial tenants of the site were evicted and construction of the Project commenced until the construction was completed and the new Tenant commenced paying rent. (N.B. Construction commenced in June 2006 and was expected to be completed by December 2008. It was however not known when the previous rental tenants of the FNFP site were evicted, and hence Ernst & Young was unable to calculate the total lost rental to FNPF by entering into the Project). It appears, according to the Report, that Tappoos disputed the basis of this penalty payment. It was noted in the FIL Board Minutes of 14 June 2005 that this penalty payment was only payable by Tappoos “if there was delay in finalizing the design concept of the building." Initial cost of project valued at $14m. Then increased by $22m for adding 1 extra floor to make it 8 story. This is nothing new. This is called corporate corruption. This is how they add millions to tender also and after they get the tender, then amendments are done to inflate the cost of project, sighting unforeseen circumstance, etc and multiple amendments that were not accounted for initially. Most of the board members are puppets of their masters. They are there seen to be doing the right thing. They know f'all. Go and dig any tendered projects above $5m and study the final outcome. They all have a story to tell. The ultimate corporate mafia's at its best. Isn't this why coups take place as it affects many of these millioneers when government changes hands as favourates vary for each political party!!! Do we have any innocent politicians for 2014 elections? or will they join the band wagon when push comes to shove. The problem with this information is that Vore is too think in the head to realise what is happening.He is quite content with the amount going into his acount which is peanuts compared to what Aiyarse is putting away. TheMax@9:17...you sound more like The Maxi or Da Max than TheMax.